Celebrity style signature embroidered cotton tote bag perfect for the beach or weekends away, books or shopping. 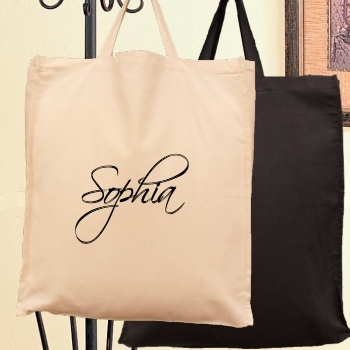 Celebrity style signature embroidered cotton tote bag perfect for the beach or weekends away, books or shopping. Comes in natural colour or black. This reusable tote bag measures 30x40cm with a 9cm gusset and short handles for easy carrying. This reusable tote bag measures 30x40cm with a 9cm gusset and short handles for easy carrying. The bag is made from 100% cotton and have a flat base and gusset edge for extra holding capacity. Personalised with your name in a swirly celebrity style signature font that is embroidered on in the thread colour of your choice. Makes an excellent gift for birthdays, Christmas, anniversaries and holidays. Even use as a school bag, shopping bag or sports/dance bag!